This is an awesome list, thanks Nick! Thank you for this. I only recenly discovered The Millions (two months ago) and am continually impressed by the writing, intelligence, book suggestions and general good-natured enthusiasm for literature, art, etc. It has quickly become one of the first sites I visit each morning. (I do plan to ‘support’ you guys, but being a state employee my pockets are quite thin at the moment). Thank you and all the other amazing writers at this site. Book lovers and struggling writers are not alone! Give Me Something to Read (givemesomethingtoread.com) has been sharing long reads on Tumblr much longer than Longreads has. I have to put it out there and represent my people: http://freepressbooks.tumblr.com/ for new, more frequent literary tumblr miscellany. The Bat Segundo Show has a Tumblr now. Great list! I didn’t know The Millions had a Tumblr, and now I’m following it. Thanks for all the submissions, everyone. I knew I was leaving some deserving accounts out, so I apologize for any oversight. Also, a scheduling note, the majority of this piece was assembled about a month ago, so anything we’ve only recently discovered was left off the cut — all told, perhaps a Part 2 is in order in the near future. You forgot Free Press Books over at S&S! The American Scholar has a tumblr as well! We are small but growing. Thanks, Nick — It’s great to get a survey of literary tumblrdom. http://www.pagetwentyseven.tumblr.com … eventually it’ll have the text from the 27th page of every book i own. I recently started http://nonmodernist.tumblr.com as a place to collect info about early 20th century writers who aren’t, you know, Woolf and Eliot and Joyce and Faulkner. http://FictionThatMatters.tumblr.com: This is a 5-year old blog that I finally migrated onto Tumblr. Reviews of stories about human rights (basically anything free expression and arts related). Hi Nick! Awesome list. I’ve been on tumblr for more than a year and many of these I hadn’t even been aware of until now. They’ve also compiled a nice list of YA authors on tumblr too! Several months ago I noticed the great literary community on Tumblr, and with several other writers began our own–through the support of many university blory’s. You guys forgot my tumblr-blog, Literary Trashcan. Tune in for all sorts of literary trash and left-overs. Kaffe in Katmandu is/was a great literary venue. This is fantastic. I would love to post this on my site, with attribution and link. Is that OK? We’d rather you didn’t post the full text. Thanks. Don’t look at the other stuff though it’s fairly bonkers. Check out http://literaryartifacts.tumblr.com. More to come from Norton in the fall of 2012. Neither are entirely literature-centric, but I most enjoy http://bookaddicted.tumblr.com/ and http://mythologyofblue.tumblr.com/ from my followers. For book-as-object I think http://fuckyeahbookarts.tumblr.com/ does a great job of showcasing the altered book. And, cough, I also post a fair amount of book-related musings on my own tumblr. Thank you for the list a wonderful way to spend a Sunday morning. Both the The Essayist http://essayist.tumblr.com/ and its sister tumblr, The Documentarian http://thedocumentarian.tumblr.com/ are essential for me. Thanks, Nick; we at Los Angeles Review of Books salute you and appreciate the nod! Thank you for the acknowledgement, Nick. We’re in the middle of redesigning our website. Once that’s finished (spring), we’ll have even more time to invest in the Tumblr. Great list! I’m off to follow most! I am an author using tumblr for two blogs, because I *love* tumblr. I do wish it were more google-friendly, but whatever. Mine are RedTash.com & LesleaTash.com. My husband’s tumblr is TimTash.com, and he writes fantasy. Long live tumblr! You can now cross us off your wish List. I can tell this is a very helpful list, and for the first time I went to Tumbler, but…I can’t tell what it is (??) If I “sign up,” will they be sending me emails? Is there a place to post comments on what other people put up? Great list… and funny timing. 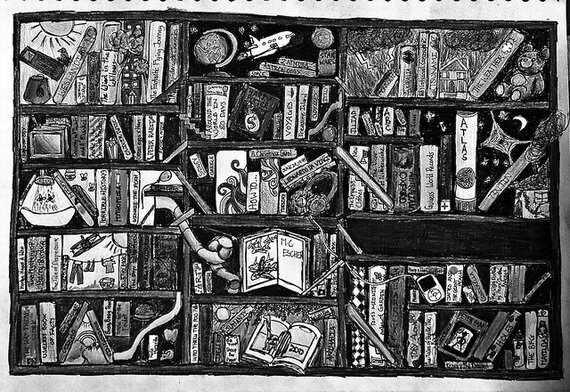 We’ve got staff reads, general book-related musings, and fun scans of the random objects we find embedded in the pages of used books. errr thought i had more, hence the “these”. oh well. Literary radio program and Web site. Accepts submissions for Poem of the Week. Interviews with poets and writers. Music and interviews from up-and-coming musicians. Other original content. I’ve never met a (book/reading) list I didn’t love. Thanks, Nick. Really wonderful stuff here. a fairly new one, but seems inspiring. Thanks to this list I think I’ve almost doubled my “following” list. http://www.petrichorpress.tumblr.com is the official tumblr of my arts & literary journal Petrichor Review. As a tumblr lover-user, I appreciated this list and subscribed to all your recs–thank you–didn’t realize so much talent was at my fingertips and in my dash. May I also recommend WhiteElephantInTheRoom.tumblr.com? Not my site–have never even met the writer. Quite literary. Great voice. Pingback: È arrivato un bastimento carico carico di... Bookatini! http://hungry-for-books1.tumblr.com/. A blog called Hungry for books combines food & books, how can it get any better than that? !